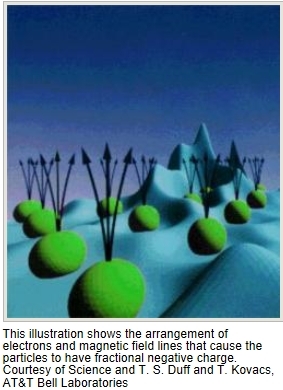 Simluations slice an electron in half, a physical process that cannot be done in nature. Durham, NC- While physicists at the Large Hadron Collider smash together thousands of protons and other particles to see what matter is made of, they're never going to hurl electrons at each other. No matter how high the energy, the little negative particles won't break apart. But that doesn't mean they are indestructible. Using several massive supercomputers, a team of physicists has split a simulated electron perfectly in half. The results, which were published in the Jan. 13 issue of Science, are another example of how tabletop experiments on ultra-cold atoms and other condensed-matter materials can provide clues about the behavior of fundamental particles. In the simulations, Duke University physicist Matthew Hastings and his colleagues, Sergei Isakov of the University of Zurich and Roger Melko of the University of Waterloo in Canada, developed a virtual crystal. Under extremely low temperatures in the computer model, the crystal turned into a quantum fluid, an exotic state of matter where electrons begin to condense. Many different types of materials, from superconductors to superfluids, can form as electrons condense and are chilled close to absolute zero, about -459 degrees Fahrenheit. That's approximately the temperature at which particles simply stop moving. It's also the temperature region where individual particles, such as electrons, can overcome their repulsion for each other and cooperate. The cooperating particles' behavior eventually becomes indistinguishable from the actions of an individual. Hastings says the phenomenon is a lot like what happens with sound. A sound is made of sound waves. Each sound wave seems to be indivisible and to act a lot like a fundamental particle. But a sound wave is actually the collective motion of many atoms, he says. Under ultra-cold conditions, electrons take on the same type of appearance. Their collective motion is just like the movement of an individual particle. But, unlike sound waves, cooperating electrons and other particles, called collective excitations or quasiparticles, can "do things that you wouldn't think possible," Hastings says. The quasiparticles formed in this simulation show what happens if a fundamental particle were busted up, so an electron can't be physically smashed into anything smaller, but it can be broken up metaphorically, Hastings says. He and his colleagues divided one up by placing a virtual particle with the fundamental charge of an electron into their simulated quantum fluid. Under the conditions, the particle fractured into two pieces, each of which took on one-half of the original's negative charge. As the physicists continued to observe the new sub-particles and change the constraints of the simulated environment, they were also able to measure several universal numbers that characterize the motions of the electron fragments. The results provide scientists with information to look for signatures of electron pieces in other simulations, experiments and theoretical studies. Successfully simulating an electron split also suggests that physicists don't necessarily have to smash matter open to see what's inside; instead, there could be other ways to coax a particle to reveal itself.